The Afghan National Security Forces (ANSF) Advisor Guide serves as a reference for currently serving or deploying U.S. personnel and coalition partners. As a reference, it describes and illustrates the historical context, forces, and force structure of the ANSF across the DOTMLPF-P domains. Likewise, this handbook complements the ISAF Security Force Assistance Guide as a means of understanding the ANSF's structure and processes. This reference brings together lessons and operating experiences to offer key leaders and individuals a lens from which to expand and improve upon their professional knowledge base, their skill levels, and their abilities in working with and improving upon ANSF capabilities and capacity. 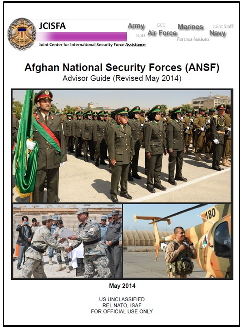 The Afghan National Security Forces (ANSF) Advisor Guide (May 2014) is available to read online or download at the Joint Center for International Security Assistance (JCISFA) website at the link below. Access to the website requires registration that will provide a username and password.